In a dramatic reversal of fortune lowest-ranked GCL team Hamburg Giants put in their strongest result of the season in a thrilling first round in Paris. Despite being one of the first teams to start, Sameh El Dahan and René Lopez pulled out a flawless double clear to shoot the team to the top of the leaderboard and into prime position to collect much needed ranking points. In an edge-of-the-seat first round, Giants took pole position ahead of Montreal Diamonds and Madrid in Motion, with only three teams on double clear in today’s class. There was further drama after overall ranking leaders London Knights pairing of Ben Maher and Olivier Philippaerts picked up an unusual 8 faults, with Championship rivals Valkenswaard United finishing ahead on a team score of four after Bertram Allen and Marcus Ehning delivered for their squad. 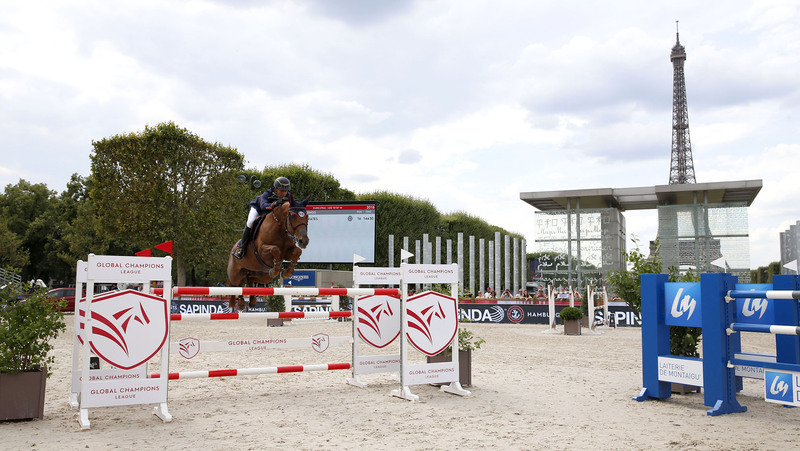 With the first eleven teams all within four faults of each other, Saturday's GCL Paris final is set to be a tantilising showdown, with every fault counting in the season long campaign for a qualifying place in the GC Prague Playoffs and prestigious GCL Super Cup. Uliano Vezzani put together a long and galloping track in the square sand arena, with the Eiffel Tower the picturesque backdrop to the tenth leg of the Championship race. A gappy treble set against the open public long side threw forward a few challenges, as well as a wide Massimo Dutti oxer, a Longines liverpool and a yellow Renault oxer to finish. Spectators and VIPs took in sumptuous views of the Eiffel Tower, as the sun shone down on the first day of competition in the French capital city. First to go Edwina Tops-Alexander of St Tropez Pirates had an early rail with California, the GC Prague Playoffs vertical tumbling as the duo flew along the VIP long side. There was disappointment for the team, after Pieter Devos and Haloubet Hitchcock collected another 12 faults, putting the team on a score of 16 ahead of Saturday’s second round and way off the mark to be in with a chance of a podium. Hamburg Giants, who currently sit at the bottom of the overall Championship, pulled a magnificent double clear out of the bag after Sameh El Dahan with Suma's Zorro and René Lopez with Twig du Veillon, put in a faultless round, the first of the teams to do so. New signing, Peder Fredricson of the Prague Lions made his debut for the team, bringing out his Longines Global Champions Tour Grand Prix of Cannes winning horse Hansson Wl, taking a steady and careful approach to the galloping course. With a celebratory buck, the pair cleared the last, putting the team in the best position possible for a chance at maximum points this weekend. Teammate and anchor Niels Bruynseels just clipped the white plank with Cas de Liberte, and the final yellow Renault oxer also fell putting the team on a total of 8 faults. There was drama from New York Empire, after four faults from Scott Brash with Hello Forever and an elimination from Georgina Bloomberg with Manodie H meant the team would tumble to the bottom of the leaderboard and out of the competition for the rest of the weekend. Shanghai Swans started their charge back up the overall rankings, after U25 rider Alexandra Thornton with HHS Figero, and Pedro Veniss with Uccello de Will both collected a single time fault, putting them at the sharp end of the grid with a total of two faults. Fresh from their win in Monaco, the Rome Gladiators were looking to ride the crest of the wave of success today, putting forward Laura Kraut with Zeremonie up front, the top American rider going clear. Italian talent Lorenzo de Luca couldn’t match the high standard set, clipping a pole with Jeunesse van’t Paradijs and collecting four faults for the team and dropping them out of the top three. Speaking after her round, Laura explained their strategy: “[Zeremonie] hasn’t jumped in a small ring like this in a while - she was very relaxed and her focus was great. We both decided if we were clear though the double we would take the long route and stay clear. We’re on four, so we’re in the hunt. As per usual if you try to go quick you risk having a fence down, and you can’t be overly cautious - I think we did the right thing and hopefully we can deliver on Saturday." There was drama for overall ranking leaders after Ben Maher with Explosion W picked up 8 faults, despite a strong start from teammate Olivier Philippaerts and H&M Legend of Love, dropping the team into the second half of the field with an uphill battle heading into Saturday. Madrid in Motion were the second team to go double clear, after a perfect round from Eduardo Alvarez Aznar with Rokfeller de Pleville Bois Mar and Marc Houtzager with Sterrehof's Calimero. But their time couldn’t match the Giants, putting the team just behind but in a strong position for the second round. Final team to go Montreal Diamonds fielded two star strikers - World Number 1 Harrie Smolders and U25 star Jos Verlooy, both of whom have been on phenomenal form in recent weeks. First to go Jos Verlooy put in some impressive jumping, riding Igor clear and fastest of all to shoot the Diamonds up and with a chance of pole. The pressure sat squarely on Smolders’ and Don VHP Z’s shoulders, but the Dutchman kept his cool, delivering a flawless round but not quite fast enough to better the Giants’ time. So it would be a successful day for the Giants, with the team looking to keep a completely clean score on Saturday and start their charge as one of the 16 teams to qualify for the GC Prague Playoffs.